Fermentation refers to the metabolic process by which organic molecules (normally glucose) are converted into acids, gases, or alcohol in the absence of oxygen or any electron transport chain. Fermentation pathways regenerate the coenzyme nicotinamide adenine dinucleotide (NAD+), which is used in glycolysis to release energy in the form of adenosine triphosphate (ATP). Fermentation only yields a net of 2 ATP per glucose molecule (through glycolysis), while aerobic respiration yields as many as 32 molecules of ATP per glucose molecule with the aid of the electron transport chain. The study of fermentation and its practical uses is named zymology and originated in 1856 when French chemist Louis Pasteur demonstrated that fermentation was caused by yeast. Fermentation occurs in certain types of bacteria and fungi that require an oxygen-free environment to live (known as obligate anaerobes), in facultative anaerobes such as yeast, and also in muscle cells when oxygen is in short supply (as in strenuous exercise). The processes of fermentation are valuable to the food and beverage industries, with the conversion of sugars into ethanol used to produce alcoholic beverages, the release of CO2 by yeast used in the leavening of bread, and with the production of organic acids to preserve and flavor vegetables and dairy products. The main function of fermentation is to convert NADH back into the coenzyme NAD+ so that it can be used again for glycolysis. During fermentation, an organic electron acceptor (such as pyruvate or acetaldehyde) reacts with NADH to form NAD+, generating products such as carbon dioxide and ethanol (ethanol fermentation) or lactate (lactic acid fermentation) in the process. There are many types of fermentation that are distinguished by the end products formed from pyruvate or its derivatives. The two fermentations most commonly used by humans to produce commercial foods are ethanol fermentation (used in beer and bread) and lactic acid fermentation (used to flavor and preserve dairy and vegetables). This figure depicts the processes of glycolysis and ethanol fermentation. In ethanol fermentation, the pyruvate produced through glycolysis is converted to ethanol and carbon dioxide in two steps. First, the pyruvate releases carbon dioxide to form a two-carbon compound called acetaldehyde. 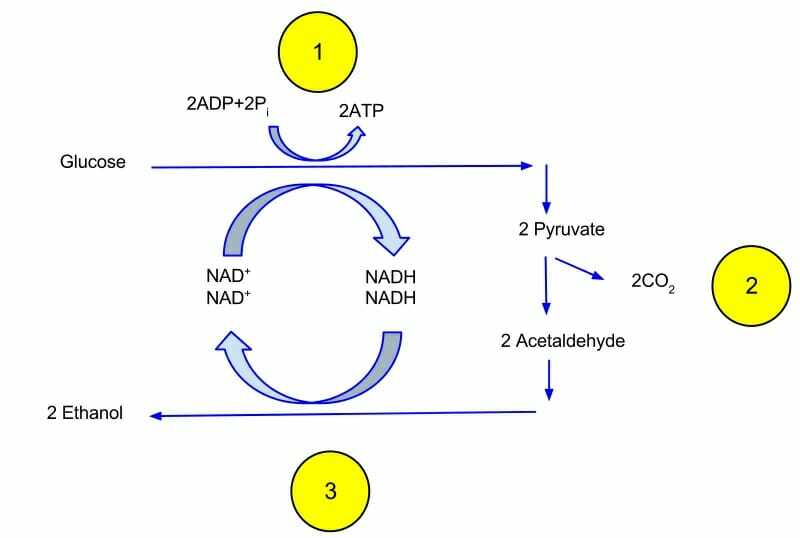 Next, acetaldehyde is reduced by NADH to ethanol, thereby regenerating the NAD+ for use in glycolysis. Overall, one molecule of glucose is converted into two molecules of carbon dioxide and two molecules of ethanol. Ethanol fermentation is typically performed by yeast, which is a unicellular fungus. This figure depicts the processes of glycolysis and homolactic fermentation. There are two main types of lactic acid fermentation: homolactic and heterolactic. In homolactic acid fermentation, NADH reduces pyruvate directly to form lactate. This process does not release gas. Overall, one molecule of glucose is converted into two molecules of lactate. In heterolactic fermentation, some lactate is further metabolized, resulting in ethanol and carbon dioxide via the phosphoketolase pathway. Lactic acid fermentation is primarily performed by certain types of bacteria and fungi. However, this type of fermentation also occurs in muscle cells to produce ATP when the oxygen supply has been depleted during strenuous exercise and aerobic respiration is not possible. While there are a number of products from fermentation, the most common are ethanol, lactic acid, carbon dioxide, and hydrogen gas (H2). These products are used commercially in foods, vitamins, pharmaceuticals, or as industrial chemicals. In addition, many less common products still offer commercial value. For example, the production of acetone via the acetone – butanol – ethanol fermentation was first developed by the Jewish chemist Chaim Weizmann and was important to the British war industry during Word War I. 1. What is the coenzyme regenerated by the process of fermentation? B is correct. 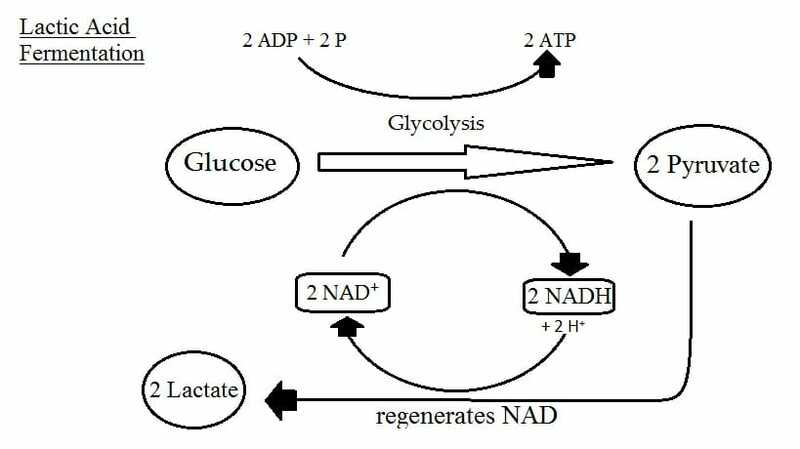 Fermentation converts NADH back into the coenzyme NAD+ so that it can be used again for glycolysis. NADH is used in fermentation, but it is NAD+ that is regenerated in the process. 2. Which type of fermentation occurs in muscle cells during strenuous exercise? C is correct. Ethanol fermentation is performed by yeast. Mixed acid fermentation and butyric acid fermentation are performed by bacteria. Lactic acid fermentation may be performed by bacteria or in muscle cells when the oxygen supply has been depleted during strenuous exercise. 3. Which chemist famously demonstrated the role of yeast in fermentation? B is correct. While Chaim Weizmann is also famous for his research on fermentation, Louis Pasteur was the first to attribute the fermentation of sugars by yeasts, creating the field of zymology. Reece, J. B., Urry, L. A., Cain, M. L., Wasserman, S. A., Minorsky, P. V., & Jackson, R. (2014). Campbell Biology (Tenth edition). Boston: Pearson. Kauffman, G. B., & Mayo, I. (1994). Chaim Weizmann (1874-1952): Chemist, biotechnologist, and statesman. Journal of chemical education, 71(3), 209. Chojnacka, K. (2006). Fermentation products. Chemical engineering and chemical process technology, 12. Ganguly, Subha. Chemical aspects of fermentation technology in food processing industries. Research Journal of Chemical and Environmental Sciences 1.1 (2013): 42-43.